Capote. Ray. Malcolm X. Nixon. Milk. Ali. Chaplin. Do these ring a bell? 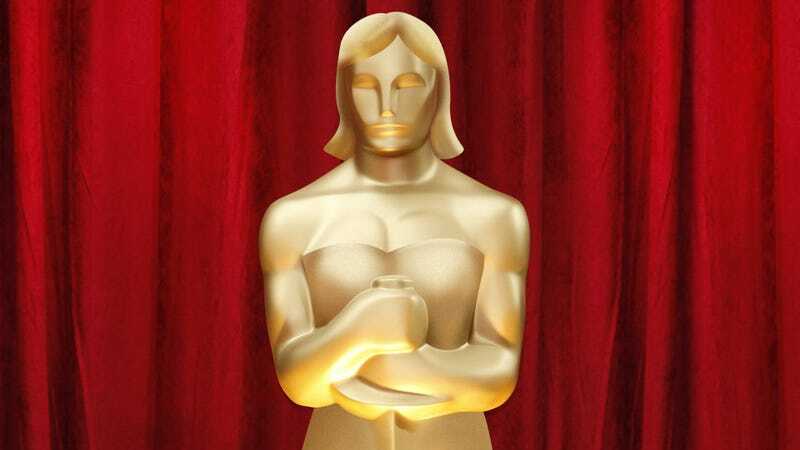 They are the names of famous politicians, filmmakers, activists, authors and athletes who inspired biopics that were nominated for Academy Awards over the last 20 years. They're also all men. Every awards season, film pundits debate whether this is "the year of women" or "a bad year for women's roles." 1992 is noted for being one of the worst for women's parts in films. Billy Crystal crudely remarked that the most talked about women's parts were Sharon Stone's in Basic Instinct. Is anyone really surprised that the Academy Awards is on the guy's team? The statue itself is a naked dude with a big sword named Oscar. After all, they don't call ‘em the Sarahs or the Lisas. Still, this quote initiated a challenge in my mind: What can we learn by looking at Best Actress nominees and winners throughout the past 20 years? Have women gained any ground in the Oscar arena? According to my research, 2012 doesn't look better than 1992. Look no further than this year's top Oscar biopic, Lincoln. Yet again, we're looking at a movie about the life of a legendary man. There are only two notable female characters in the entire film. Despite her historical significance, Sally Field's Mary Todd could be yanked from the plot without impacting the story of Lincoln's emancipation proclamation or his efforts to end the war whatsoever. The heavy lifting in the film is at the hands of Daniel Day-Lewis, David Strathairn and Tommy Lee Jones. Lincoln will ride into the Oscar battlefield with its star-spangled banner flying high and emerge triumphant. Last year's The Iron Lady, another film about an iconic world leader, also triumphed at the big show, taking home Best Actress and Best Makeup; yet Lincoln almost made more in its first weekend in wide release ($22.5 million) than The Iron Lady did in its entire US run ($30 million). It also wasn't a Best Picture nominee, which leads me to my next point- women have been shortchanged when it comes to the pictures that are the Academy's favorites for the year. Since 1992, women have received Best Actress nominations from Best Picture winners or nominees 29 times. Men have received Best Actor nominations from Best Picture nominees 47 times. Obviously, there have been some incredible performances by women in Best Picture caliber films over the last 20 years, and said films have featured indelible portrayals of women as well, such as Hilary Swank's heroic Maggie in Million Dollar Baby, or Julia Roberts' brash, brilliant Erin Brockovich. Nevertheless, the most acclaimed films of the year are most often all about guys. One man has even been the subject of two biopics- Richard Nixon. Nixon and Frost/Nixon, garnered two different men Best Actor nominations (Frank Langella and Anthony Hopkins). It's also true that Cate Blanchett was nominated twice for playing Elizabeth I in Elizabeth and Elizabeth: The Golden Age, but one of these was a sequel and a much less successful one at that. For those quick to point this out and denounce a sexist undercurrent, if there is no issue with women's roles, why couldn't they fill Blanchett's slot with another, more deserving role that year? If poorly received roles are good enough to be nominated for Best Picture, it must have been difficult to find any worthy female performances to celebrate at all. The Best Picture of the year has also won the Best Actress award twice in the last 20 years. During the same time period, the film named Best Picture has also won the Best Actor award five times. Once again, more than double the amount of male centered films are receiving accolades in favor of women dominated films. Shockingly, if you dissect these, only one of them has a true heroine at its core- Hilary Swank in Million Dollar Baby. The Oscars are undoubtedly the biggest game in town. Although they are by no means the only measure of a film's greatness, they are an excellent way to measure how we define cinematic art. Over the past two decades, we can clearly see Hollywood would rather put up big bucks and wage awards campaign warfare on his story, not hers. Keith Dodge is a film blogger and freelance writer. He studied film and journalism at Ohio University and focuses on the science behind the Oscars in his blog "Oscarology." He lives in Columbus, Ohio, with his wife. Connect with him at www.kdoscarology.blogspot.com or on Facebook and Twitter.